The transition from summer to fall can be a hard pill to swallow. It's somewhat easier knowing the consolation prize is fall fashion. More specifically, we're excited to switch gears from sandals to ankle boots. The ankle boot is the unofficial transitional shoe for fall. Even when the weather can't decide between tropical or tundra status, an ankle boot adapts with utter ease. Plus, this season's ankle boot selection features a variety of new and returning trends to get excited about. If you're hoping to try a new trend like a slick white boot or you're sticking to a tried-and-true style like the classic, there's something out there to fit every budget. Cougar's playful take on the classic Chelsea boot is perfect for the damper days of fall. The glossy ankle-length rainboot is available in a variety of fun colours and features a small platform for a little extra boost. Just because the weather is cooling down doesn't mean the party's over. Fall still calls for great going-out footwear and we're still not quite over the heeled sock boot. With '90s grunge coming back into vogue, these Zara studded ankle boots strike a perfect balance between rocker chic and sophistication. At $60, they're also an absolute steal. Sneaker and boot hybrids are on the rise. Converse released their own sneaker-boot mashup that's sleek, utilitarian and not what you would expect of a cold weather shoe. 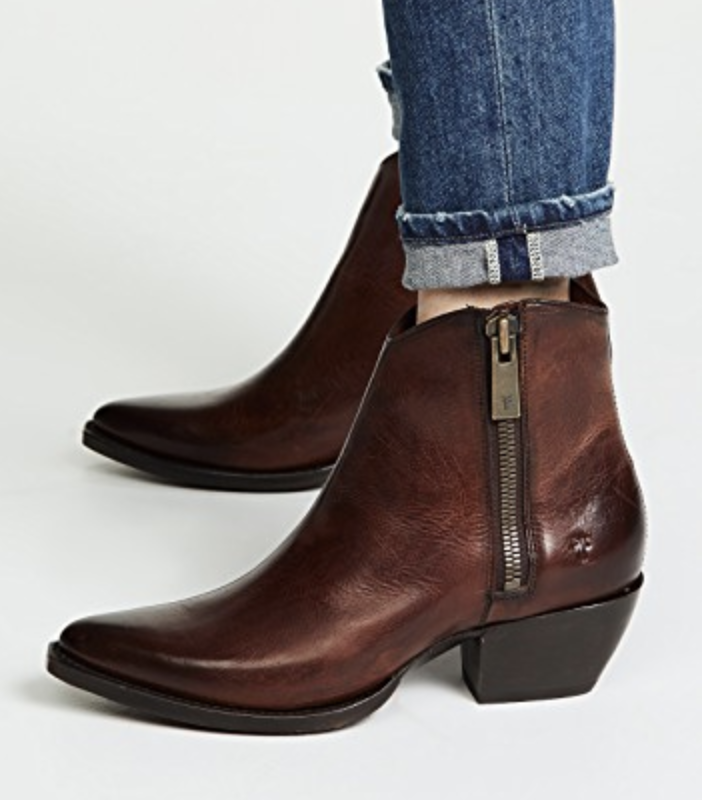 A heeled Chelsea boot is never a bad investment. Call It Spring is selling a versatile Laralivia boot that features a modern silhouette, a comfortable two-inch heel and comes in a variety of colours. One of the biggest trends to emerge from fall 2018 is the white boot. This ankle length boot features a silhouette reminiscent of the 1970s that will give you major Nancy Sinatra vibes. Plaid is trending for fall in a big way and Aldo is simply supplying the demand with their chic grey-and-red plaid ankle boot. A rich burgundy is the perfect shade if you want to stray from neutrals, but don't want to go full on mustard yellow. Native Shoes' Treklite boots in Alpine Yellow will brighten up your wardrobe during a long, dreary winter. The adorable boot doesn't just talk a stylish game, it's also practical with microfleece lining, an ultra light rubber sole and serious grip. These floral embroidered booties are a lot more versatile than you think. Expertly pair them with a "clashing" pattern or let them shine against a simple monochromatic outfit. Western-style boots are poised to become the "it" boot for fall. If you don't want to blend into the crowd, here's a bold collaboration from Free People and Jeffrey Campbell that will have admirers doing a double take. Animal print is proving to be a huge fall trend yet again. This luxe snakeskin boot from J. Crew won't stay available for long, especially at its current sale price of $127.99. When it comes to Frye's classic Western-style boots, quality trumps quantity. This forever boot is something you can likely pass down to the next generation. Believe it or not, the beauty of these elegant sequin boots lies in its versatility. You can wear them with a dress to the event of the year or dress them down with a pair of jeans for a casual fall stroll. There's a reason "hiking chic" is a term, and there's no better time to show off the style than in the cooler months. Fall is one of the most beautiful seasons to take a stroll through nature and no one's ever said you shouldn't do it in designer hiking boots.